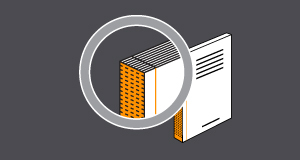 Burst binding is a type of Perfect Bind where the binding edge of folded sections have been ‘notched’ instead of pre-trimmed, creating a strong bite for the adhesive. Saddle Stitching is the quickest, most cost effective form of binding for thin to medium thickness documents. Saddle stitching involves running a line of staples, usually 2 or 3, along the spine of the document. Saddle stitch bound documents have the advantage of being able to be laid open flat. Perfect binding uses a flexible adhesive to join a cover to the spine of a collated document where the folded sections of pages have had the binding edge pre-trimmed. Modern PUR binding uses polyurethane resin glue which gives a strength as strong, if not stronger, than burst binding. Case binding is the most common form of binding for hard cover books and involves sewing the folded sections of pages together and then adhering the end papers onto a hard back, lined cover. The process is usually undertaken by a specialist book binder and involves intensive manual labour. Side stitching is a form of binding used on thick publications – such as manuals. It involves running a staple through the width of all the collated pages and then wrapping the document with a cover that is adhered to the spine. In this way it is very strong, but has the disadvantage is that the document can not be laid open flat. All these methods involve pre-drilling or hole punching through the collated trimmed pages, through which a pre-manufactured bind, usually made of plastic or wire, is threaded. This bind method is often used in quick turn-around documents as the processing time is very efficient and does not require specialist services.